This is a no technical question but one I need to answer myself before jumping into QODBC. 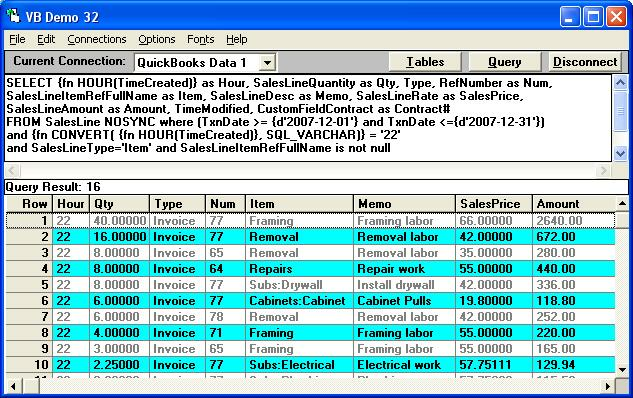 I'm considering start working with QODBC to get the information we can't get easily from QuickBooks reports. What I would like to ask people working with QODBC and QB and QB POS is if QODBC is able to access and work with information related to the time of purchases. For example view items that sell the most at 11 AM or between 4 and 5 PM and also see what those items are. I don't know if this information is located on the QB or the QB POS file. If someone could tell me If I could I access this type information, I could start working with QODBC. I would appreciate any help. Where '22' is the hour using 24 hour format.